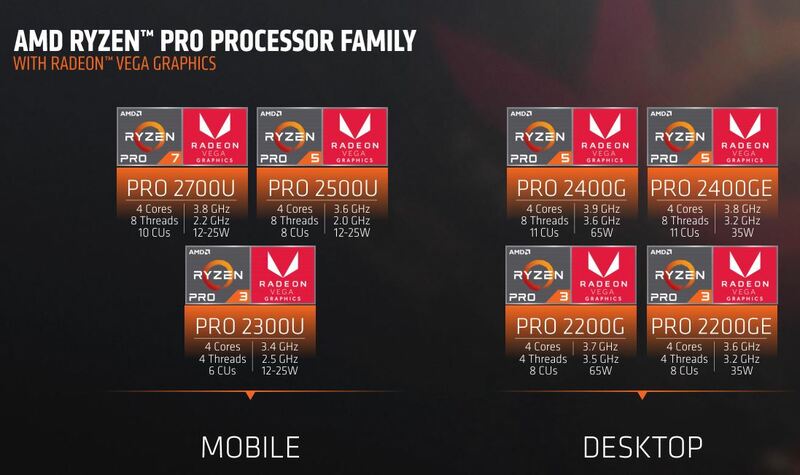 Today the AMD Ryzen Pro with Radeon Vega Graphics family is launching following up on last year’s AMD Ryzen Pro launch. The Ryzen Pro brand is AMD’s line for the business desktops and is most similar to Intel vPro. You can read more about the offering in our piece: AMD Ryzen Pro Launches as a Tantalizing Alternative to vPro. 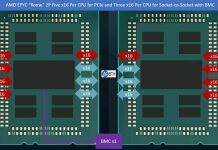 These chips highlight AMD’s security technology, longer availability window for enterprise customers, and remote management capabilities. 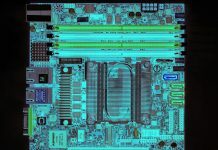 The Intel vPro management engine has long been under fire as it provides a low-level configuration and troubleshooting capability, more akin to IPMI on the server side, on client PCs. Likewise, if someone has the AMD features turned on, IT admins can remotely manage endpoints based on Ryzen Pro. Here are the seven initial launch SKUs. There are two main families. The desktop and mobile parts. The mobile parts have configurable TDP of 12W-25W. On the desktop size, there are 35W parts meant for small, screen mountable workstations like the Lenovo Tiny. We reviewed that offering in our piece: Lenovo nails small form factor with its ThinkStation P320 Tiny. The 65W parts are for larger, more traditional workstations. 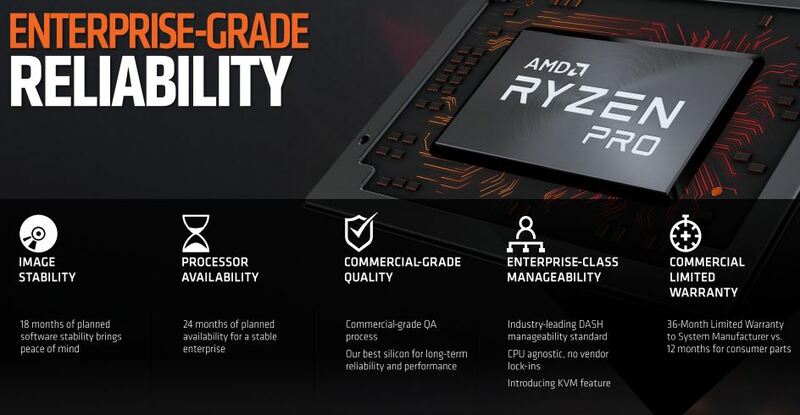 AMD is being fairly selective in its comparisons. 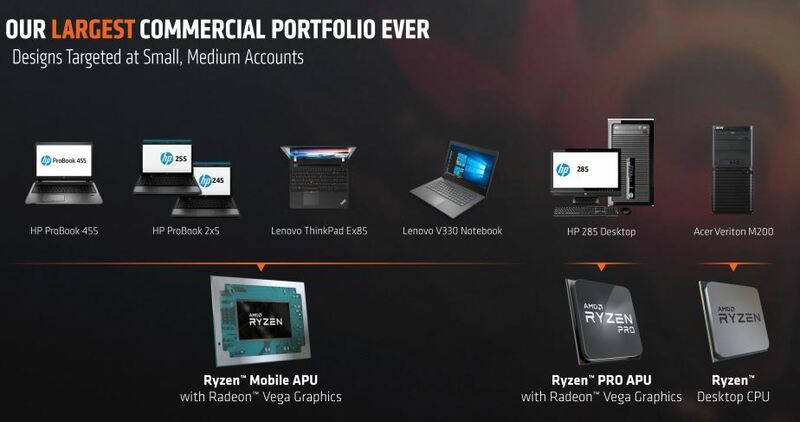 AMD has the performance this generation, but unlike the consumer segment that will rapidly adopt new offerings, the commercial segment moves slower. 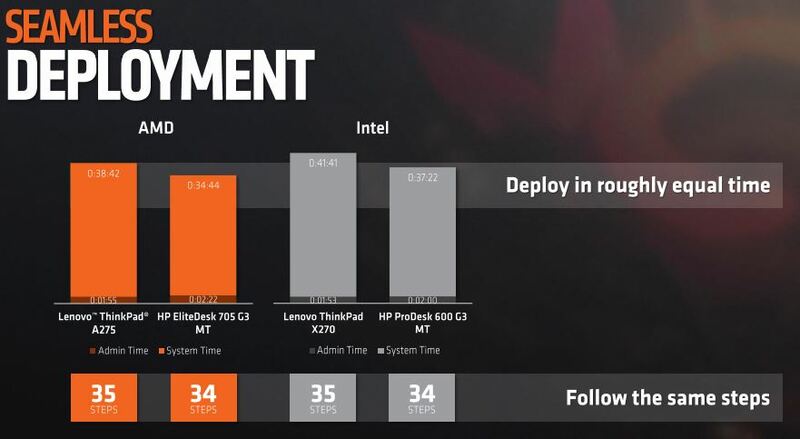 As we saw with the desktop Ryzen APU launch, AMD claims that its performance is equal to Intel’s 8th generation on the CPU side, but pulls away on the graphics side. 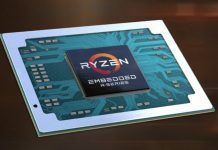 The vast majority of Ryzen Pro systems Patrick saw at the briefing were single channel memory designs which hurts integrated graphics performance to a large degree. More importantly, it wanted to show that for the IT admin, the deployment would take the same amount of time as their Intel counterparts. 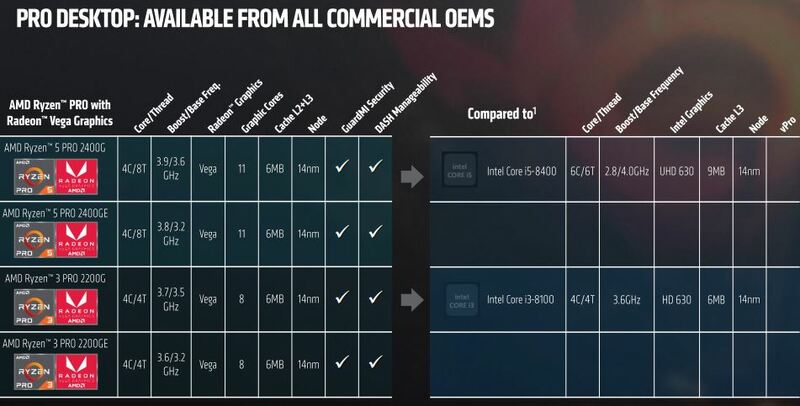 Likewise, AMD is showing that they have the features (beyond security) to meet the needs of IT organizations. Overall, AMD has its feature set, but needs to get its chips into the market via partners. These systems are primarily sold to enterprise customers and SME customers via large systems providers. AMD had Dell, Lenovo, and HP at the event showing off their AMD Ryzen Pro designs. Several of these designs did not use the Ryzen Pro part and instead used the “vanilla” Ryzen Mobile APU while others used the CPU only parts. AMD is claiming that it has its largest ecosystem and more momentum with its latest generation. When the original Ryzen Pro launch happened, AMD came out with CPU only parts. That made sense as that is what the company had at the time. What the market needed/ wanted was the APU part and that is finally here. There is a valid line of thinking which says why does one need more GPU than to play videos and do office productivity applications for the vast majority of spreadsheet jockeys and PowerPoint gurus. 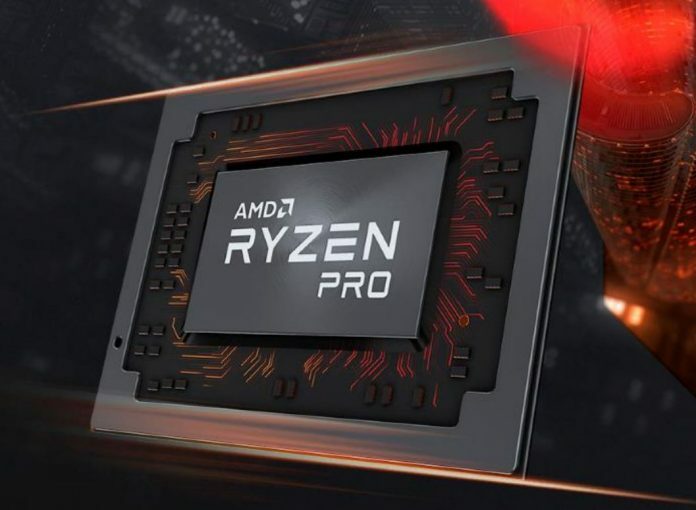 Still, this APU launch has compelling CPU performance and more GPU performance, with its new AMD Ryzen Pro with Vega Graphics line and it seems like major OEMs are making systems to offer to their customers as an alternative to Intel. Enterprises are slow to move, so the process is likely to be slow unless pricing is extremely attractive. Time will tell how this one goes. If you want to buy from Dell they hide the Ryzen Pro models. You pretty much have to know that they exist and call your salescritter. Between that and the horrible failure rate we’ve had with our 5480’s I’d really, really like to give HP a try. Agree 100% about wanting official ECC support. “Pro” my [body part]. Yep that is a pitty, all the hardware is ready to use ECC with all of the Ryzen’s. I don’t know who is blocking the use of it?? ?